In a Friday afternoon matchup versus the crosstown rival Cubs, John Danks took on the challenge of trying to stop the White Sox streak of bad pitching performances. After a couple of days of White Sox pitching getting crushed, Danks looked solid while taking the loss. Danks was decently efficient in his pitches, throwing 66 percent of them for strikes. Unfortunately for him, Luis Valbuena took one of his pitches deep in the top of the fourth for a three run home run to give the North Siders a 4-0 lead. Danks would end up leaving at the end of the fifth inning and finished with a stat line of four runs on six hits and two strike outs. Danks has had a pretty efficient spring which is always good. He’s doing so by locating his pitches well, especially cut fastball pitch that he’s been working on which was very flat last season. It would be helpful for the White Sox can go to battle with three efficient lefties at the top of their pitching rotation. Most teams have trouble finding and keeping two left-hand pitchers to fill out their rotations. The Sox are hoping that Danks could give them something substantial back on the three years at $14.25 million per year investment they have in him. Luis Valbuena struck again in the seventh off of Scott Downs to make it 5-0. The Cubs would go on to add two more on a wild pitch in the seventh and a single in the ninth. The Sox hitters seemed baffled by the Cubs pitching staff. Abreu, Dunn and Garcia had one hit each which was all the offense the White Sox could manage to produce. The only note for the offensive side of the ball was catcher Tyler Flowers leaving the game in the bottom of the sixth after swinging at a pitch from Cubs reliever Alberto Cabrera with leg cramps. He would be replaced by pitch hitter Jaime Pedroza in the at-bat and by Adrian Nieto behind the plate on defense. Next on the block was a split squad against the San Diego Padres and San Francisco Giants on Saturday. The White Sox made six roster moves today as they cut their active roster to 38 players. In the most notable move of the day, they reassigned catcher Josh Phegley to their Triple-A Charlotte club. Coming into Spring Training, Phegley was in competition with Tyler Flowers for the starting job at the catcher spot. The club made the announcement on Sunday that Flowers would be the starting catcher. Phegley had six hits in 23 at bats with one home run. Flowers currently has seven hits on the spring in 28 at bats and two home runs. With the competition so close, they decided to go with Flowers since he is older and has shown that he handles the pitchers well. Phegley will use the opportunity to be Charlotte’s everyday starting catcher, and work on his game to be ready for when his name is called. ”I want to play every day, and I’d like to help this club. It’s everyone’s goal to be a big leaguer. I want to be a starter, and going to Charlotte and playing every day is going to help my game out, so I’m all for it,” Phegley continued. Phegley wasn’t the only one going to the minors today. Right-hander Andre Rienzo and left-hander Eric Surkamp were also optioned down to Triple-A along with Phegley. Infielder Andy Wilkins and right-handers Chris Beck and Cody Winiarski were reassigned to the Minor League camp. The moves now leave the White Sox with 17 pitchers, three catchers, 12 infielders, and six outfielders remaining in the Major League camp. There are still 13 players left to cut to reach the 25-man roster for opening day. Schierholtz leads off while Gonzalez covers the bag. 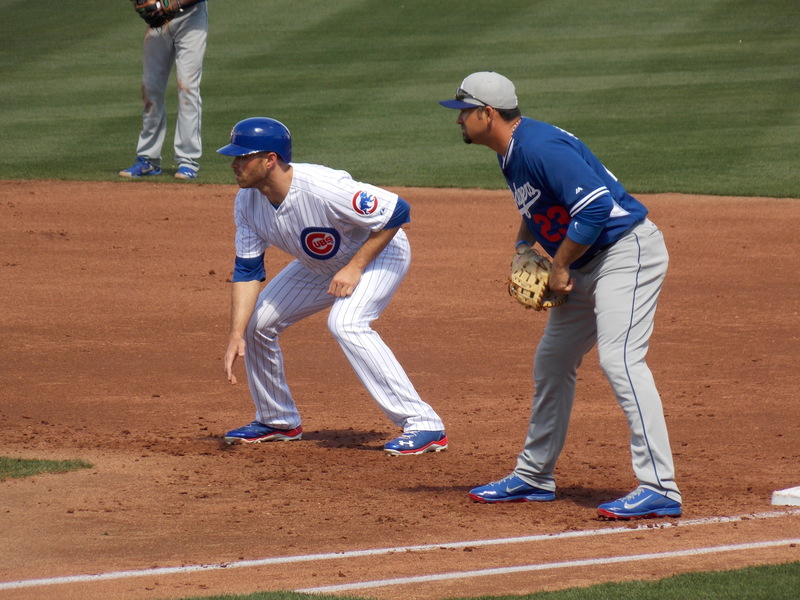 Mesa, Arizona – The Chicago Cubs’ roster is full of guys who could potentially be plugged into their outfield spots, and they also have a done of guys in their pipeline that could be contributors on the green grass at Wrigley Field at some point in the near future. So far in Cactus League play though, there is one guy that is standing out, and he is making a strong case to lock down the right field spot for the North Siders. That player is Nate Schierholtz, and he pleaded his case in a strong way on Friday afternoon at Cubs Park. In six innings of work, Schierholtz reached base all three times that he stepped to the plate, including a double in the bottom of the sixth inning that helped propel a four run Cubs rally that culminated with a Luis Valbuena home run to right-center field. That inning ended up helping the Cubs to a 5-4 victory in the game, but even without the outcome in mind, it was still clear that Schierholtz was well-suited to batting ahead of Anthony Rizzo in the Cubs’ lineup. He was willing to take pitches (as he did in his first inning walk), but he was also willing to swing the bat when necessary, as he showed when he became the first Cub to hit the ball out of the infield on a fourth inning single. Overall on the spring, Schierholtz hasn’t had outrageously great numbers, but he has still been consistent. His .375 OBP and .899 OPS are both very solid, and he has three walks to go along with his six hits in 24 plate appearances. He also had a home run and two RBI in Cactus League play. Schierholtz may not get the adulation that guys like Junior Lake receive, and he may not have the raw potential of players like Albert Almora and Jorge Soler, but he is a player who knows what his role is on the team, and he approaches the game like a savvy veteran. He definitely did that on Friday, and if he can continue to do so, then he is going to be an integral part of the Cubs’ lineup this year. Coming into Spring Training the White Sox carried 54 players on their roster, and as of yesterday they knocked it down to 47 players. This is just the first of several moves the Sox will make in the next two weeks. Gonzalez, Poveda, Snodgress, and Walker were non-roster invitees by the White Sox coming into camp. Leesman, Mitchell, Thompson, and Heath are on the 40-man roster for the Sox. It’s possible throughout the season that there could be a Major League appearance by Mitchell, Leesman, and Heath, especially the latter two pending on injuries to the bullpen. These moves now leave the Sox with 47 players in Major League camp. The White Sox now have 23 pitchers, 14 infielders, four catchers, six outfielders left in camp. 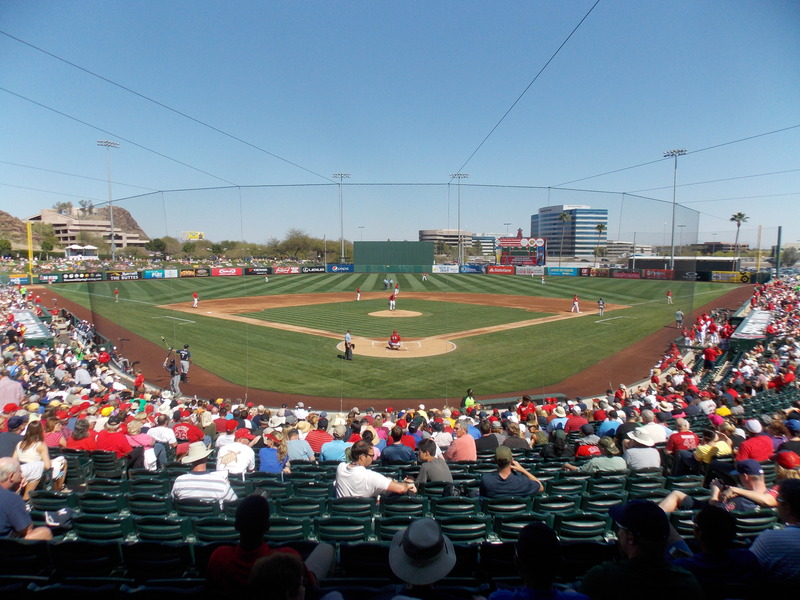 Tempe – Not sure what it is about the two Cactus League games I’ve attended so far this season, but if they are any indication, then the NL Central is going to be hideously bullied around, as I provide my thoughts on the California Angels and Milwaukee Brewers. -Okay, so the lead to this post was a complete lie. Obviously we have no idea whether or not the Central will be good this year, but odds are it will be in the conversation as the best division in baseball. It’s just hard to see that, considering the Cubs lost 13-0 on Tuesday to the Rockies, and in my second game of this baseball odyssey, the Angels racked up 10 runs in two innings and dispatched the Brewers by a score of 12-2.